A transgender student has lost his military scholarship because of his gender identity. Map Pesqueira is a first-year student at the University of Texas at Austin, and he was awarded a Reserve Officers’ Training Corps scholarship to pay for three years of school. Pesqueira, though, has already started his transition. And under the transgender military ban, which started last week, he will not be able to serve in the military. So the Department of Defense took away his scholarship. Related: The transgender military ban starts today. Here’s what you need to know. 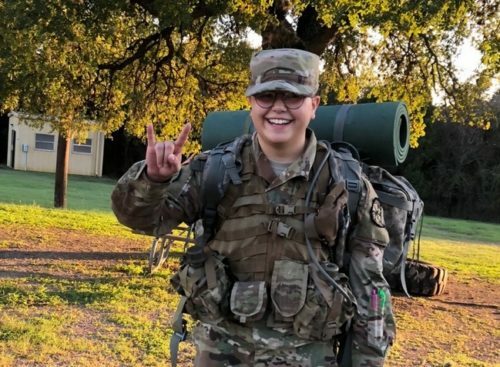 Lieutenant colonel Matthew O’Neill, the ROTC chair at the University of Texas, tried to save Pesqueira’s scholarship, the student said. O’Neill argued that that Pesquiera should be exempt from the policy because his scholarship was awarded before the transgender military ban went into effect. Under the transgender military ban, nonexempt servicemembers who have been diagnosed with gender dysphoria and who have had any gender affirming medical treatment are categorically excluded from the military. The student said that he doesn’t know if he’s going to be able to pay for college now. He has started a GoFundMe, hoping to raise $20,000 to pay for his sophomore year in TV/Radio/Film studies. He has raised over $8000 so far.